*Taken from the cooking blog: Two Peas and Their Pod Check them out for more amazing recipes! On Fridays, I teach cooking classes to two kids in our neighborhood. They are pretty knowledgeable-so my job is easy:) I think it is fantastic that they want to learn how to cook at such a young age-they are in the 3rd and 4th grade. Since we don’t have any kiddos yet, I am glad I get to work with these kids. We have a great time in the kitchen. On Friday we made homemade soft pretzels,the traditional salty ones and cinnamon and sugar pretzels. 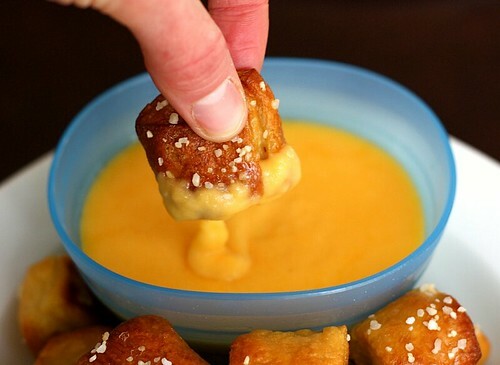 We made a cheddar cheese sauce to go with the savory pretzels and a vanilla cream cheese frosting for the cinnamon sugar pretzels. The kids were pros! They did a great job rolling out the dough, twisting, boiling, and baking the pretzels. 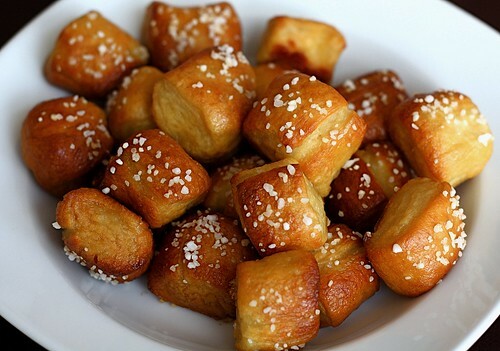 For fun, we also made pretzel bites. everyone loved these. They are perfect for dipping and snacking. 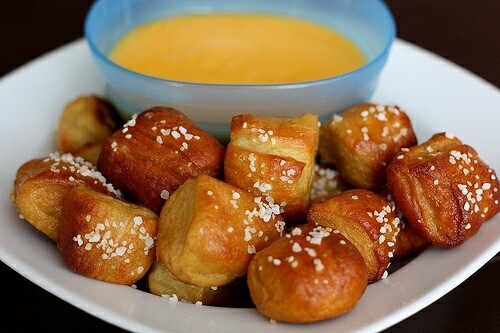 I think I will make these again on Sunday for our big Super Bowl party…and you should make them too! Buffalo Hot Wings-these are Josh’s all time favorite. They are always a hit and perfect for the big game. Chicken Smothered Nachos-we made these last year and everyone loved them. They are loaded with goodness! Pizza Stromboli with Spinach, Mushrooms, and Cheese-the great taste of pizza in one big roll! Black Bean Soup with Spicy Corn Muffins-perfect for serving up a crowd! My good friend Gaby, from What’s Gaby Cooking, made Pulled Pork Sliders for the big game. Go check out the recipe-it’s a good one! Food, and the personal preparation thereof always appeals to me…thanks Joel for taking the time to generate this post.